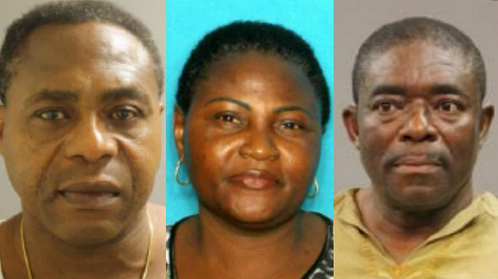 Maxwell Ezenwa, Christy Tifase and Shalewa Olayinka have been charged by the Harris County Sheriff’s Office investigators and U.S. postal inspectors in a complicated and extensive credit card app fraud. Starting in early 2014, investigators began a joint investigation of a group suspected of being involved in “fraud app” credit cards where credit cards were applied for without the victims’ consent, mailed to the victims, and stolen out of their mail boxes. Two businesses were used to process the credit cards for large unusual amounts, and then able to generate cash from the fraud apps. Those businesses were identified as Lace Warehouse and African Fashions owned by Maxwell Ezenwa and Lagos Island Café, owned by Christy Tifase. The losses sustained to the victims exceeded $500,000 and dozens of identities were stolen. Ezwena was arrested previously in this case for fraudulent use of identifying information. On Wednesday, investigators arrested Shalewa Olayinka on a warrant for engaging in organized criminal activity. Tifase has an open warrant for engaging in organized criminal activity as well.